Ford's new autonomous driving plans include a fleet of self-driving and delivering autonomous vehicles. 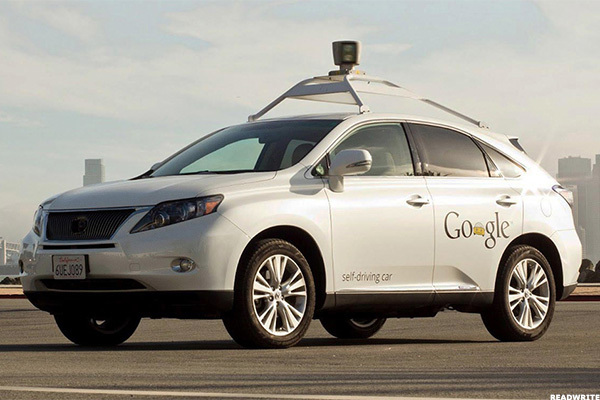 Seemingly every automaker's name has been in the self-driving car discussion. Whether it's General Motors Co. (GM - Get Report) with its self-driving taxi fleet plans or Tesla Inc. (TSLA - Get Report) with its Autopilot. There's Jaguar and Chrysler working with Waymo (a division of Alphabet Inc. (GOOGL - Get Report) (GOOG - Get Report) ) and even Uber mastering its own autonomous driving plans. But one large name that's been missing? Ford Motor Co. (F - Get Report) . That's all changing, though, with news from the automaker centering around its own self-driving car fleet. Like GM, Ford apparently sees opportunity in operating a self-driving fleet of taxis. However, while GM management is trying to launch its program as early as next year, Ford is aiming for 2021. At least, that's when it plans to operate at scale, as the automaker is currently testing in cities like Miami and London to work out the kinks. With General Motors, the plan is simple: Deploy self-driving taxis in dense urban environments to take passengers from point A to point B. Rather than a one-time sale of the vehicle, the automaker can milk hundreds of thousands of dollars in revenue per vehicle. With Ford, though, the plan is similar but has its own twist. Ford also plans to get small businesses in on the mix, allowing for self-driving transportation of goods rather than people. Effectively, it turns Ford into a self-driving delivery company as well. For these services, Ford plans on using a new vehicle capable of carrying both people or items. So it will probably be something similar to its Ford Transit van. The unit will run a hybrid engine and operate about 20 hours per day, the automaker says. Given that Ford invested $1 billion in the little-known A.I. startup Argo, investors assumed the automaker had some sort of plan when it came to autonomous driving. Well, now we're seeing what it is. The question now becomes, how does it impact the stock price? Some automakers are opting to sell their vehicles for other companies, like Waymo and Uber, to operate in a self-driving environment. These fleet sales are rewarding upfront and can help drive sales results higher. Alphabet is a holding in Jim Cramer's Action Alerts PLUS Charitable Trust Portfolio. Want to be alerted before Cramer buys or sells GOOGL? Learn more now. However, automakers like GM and Ford, at least for the time being, plan to own and operate their own fleets of self-driving cars. For that reason, investors have to consider the impact to the stock prices. Love or the hate the automakers, it's hard to make the case that they're expensive. Trading at just 6.2 and 7.3 times 2018 earnings, both GM and Ford have stubbornly low valuations, respectively. Autonomous-Driving Levels 0 Through 5 -- Do You Know the Difference? This has been the case for years though and one wouldn't realistically expect the situation to change even if the economy remains strong. However, a fleet of self-driving taxis could change that. Absent a recession, the automakers could be looking at a strong catalyst for higher valuations. Why? For starters, there would finally be a way for them to realize higher revenue without actually selling more cars. Second, if it's able to garner $150,000 out a car that typically retails for $40,000, not only will the top line swell, but the bottom line will get a boost too. That should improve margins as well. Aside from better operating numbers, though, it should help balance out the cyclicality of the business. Because Ford and General Motors are automakers, they may forever be punished during tough economic times. But the business will be more secular and less cyclical if they're relying on revenue from transportation services rather than solely on auto sales. We'll see how it shakes out in the future, but it's clear the autonomous driving revolution is happening at a rapid clip now. On Ford's autonomous driving update, shares are up 0.84% Monday to $11.38. This article is commentary by an independent contributor. At the time of publication, the author had no positions in the stocks mentioned. Elliott Management thinks SAP can significantly grow its EPS with the help of cost cuts and buybacks. A comparison of SAP's margin profile with Oracle and Microsoft's suggests it's right. The FAANG names are red hot again. They now trade at multiples close to those of August of 2018, not long before they tanked.